« New Expansion for Five Tribes: Pre-order Now! 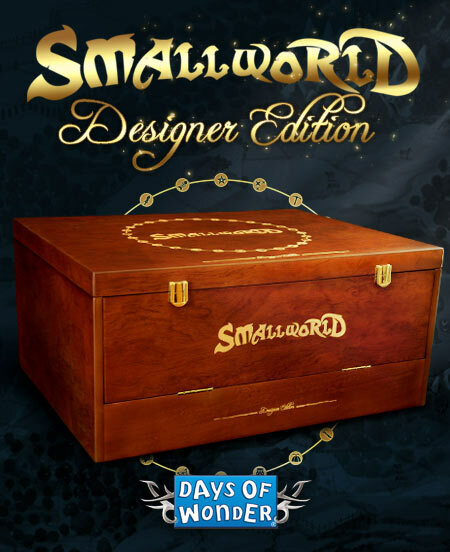 The Small World Designer Edition has just been added to our website! The first copies were sent a few months ago to the backers of our Kickstarter campaign that pledged the “Designer’s Oath” level. However, if you did not use the occasion to buy the collector’s version, now is your chance to do so. The Small World Designer Edition includes deluxe wooden tokens covering all races from the base game and the Cursed!, Grand Dames, Be Not Afraid and Royal Bonus expansions, plus Race banners and Special Powers banners that are all heat-printed on wood. The victory points are custom metal coins that vary in shape and size depending on their value, and are stored in little leather purses to hide your fortune from your opponents. 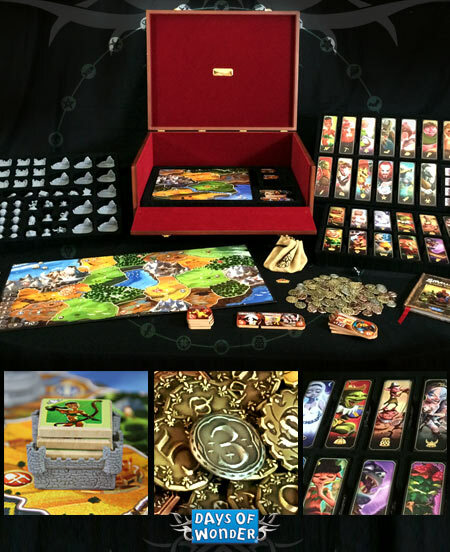 The Designer Edition also includes three super-sized boards for 2-3, 4-5 and 6 players, as well as numerous custom finely-sculpted resin figures for game elements such as the Dragon, Heroes, Pots of Gold, Fireballs, Catapult, etc. Last but not least, it also includes the famous “Pocket Encyclopedia” of Small World from the Kickstarter Campaign. Please note that the Small World Designer Edition only exists in English. There will not be any other version of this edition. On June 9, 2015, on 3 pm GMT (8 am PDT) we will open the orders for the Designer Edition of Small World. We anticipate a high amount of orders, and we must remind you that our stocks are limited. So, make sure to place your order as soon as possible on June 9! Please also note that the offer is limited to one copy per person; you cannot order several copies of the Designer Edition. This entry was posted on Tuesday, June 2nd, 2015 at 17:30 and is filed under Events, Games, News, Small World. You can follow any responses to this entry through the RSS 2.0 feed. Both comments and pings are currently closed. Hello, I am interested. How much will it be shipped to the UK please? Very much interested, at must have level. How much the shipping to Romania? Thank you. For orders to European Union Countries from our Euro Store they will be roughly €40. For orders to USA from our US webstore, they will be roughly $40. For the other countries, the webstore will calculate the fees depending on where you stay. Be prepared for a high price though as this beast is huge (the parcel weighs 20kg). I find it odd that Romania is not listed amongst the other EU countries, although your store locator gives several hits. If it’s only a mistake to which shipping region does it belong? Thank you. Many sympathies, however the miniscual time they were available (about 3 minutes by my reckoning), you would have been very lucky to get one. @Nathan, When I posted my previous message it was 8 minutes *before* 3PM GMT. Frank if you look at the time of our posts you we see that you were late. I’m in the UK. GMT is set from here so how can I be early. My original post was posted at 15:41 your reply was at 8 mins to 16:00. Because there seems to be a lot of confusion here, GMT is an absolute reference time and doesn’t change with the seasons; however, the UK is currently on Daylight Saving Time, which is GMT+1. Days of Wonder were not incorrect when they said that the product would go on sale at 3 PM GMT; this is 4 PM in the UK, as we are currently on Daylight Saving Time (DST+1). At the time of writing this it’s 11:55 in the UK, but ACTUALLY 12:55 GMT, because again, GMT is an absolute reference time that doesn’t change with the seasons. Google “GMT time” (http://lmgtfy.com/?q=GMT+time) and you’ll see that it’s currently an hour behind the time in the UK, because we are not currently on GMT in the UK; we’re on GMT+1. Could this have been better communicated by Days of Wonder? Absolutely. But they’re not wrong. Thank you Cameron, well explained. I’m guessing the time stamping of posts is location based time stamped as well then because our posts are stamped at Bloody daylight savings and not GMT. I really do wonder how many copies were available? Started to think maybe they had only a few left from the kickstarter campaign. I can’t get in. Can anyone else? Tried ordering this throught the Europstore. There are no possible shipping methods for this order, probably because it is too heavy. Your order cannot be completed. Please contact Days of Wonder Customer Service. Will it be available for purchase again? Just a little ridiculous, I had it in my cart and was entering shipping info, then went to pay and it disappeared from my cart, then couldn’t re-add it as button was gone…. Well, that’s unfortunate. I had planned on getting this, and looks like it was sold out within minutes. I didn’t really expect such a limited run.. How many were there, 4? Franck, any comment on whether this is just a site glitch, or are all copies are gone? Having waited since 3pm, looks like sales came live at 4 and sold out during the time it took me to fill in the forms. That was so worth waiting for! Someone nicked my out of my shopping cart!!! Also my typing’s gone to hell. Days of Wonder, print more copies, clearly there is demand even at this price point..
Well it’s top of the best-selling list on the main store page. Anyway, hopefully they catch on to the demand for this product and make another print run… Would of been a nice one to add to the collection. Not sold out in minutes – SECONDS! I was processing my order as soon as it came online for the basket and even had an order number, then the system wouldn’t take payment and said my order couldn’t be completed. I can’t believe it sold out that fast! Is there a technical problem on the webstore?? I had the same issue, when I clicked on visa it said server error and when I wanted try again it was gone..
People have been wanting this, since they realised it was available, I personally would of backed it if it was a kickstarter on its own, I didnt look at the digital version and see it or I would of backed it. “available for everyone should you be lucky enough to speed type in all your details and get one of the few copies available”………. Woa, that went really fast. Even we, at Days of Wonder, did not think it would sell out this fast. We understand that many of you have questions and want to know it the order really went through or not. We are going to manually check every order, to be sure that every transaction was processed correctly. Also, we need to carefully review everything and make sure we can deliver the Small World Designer Edition to everyone who submitted a correct order. Please do a kick starter for a reprint of the designer addition, minimal financial risk to DoW if you presell copies. Here’s to hoping for a reprint. Looks like we had a glitch on our Contact Us page. I’ve been trying since 7:58am Pacific Time and the site went from saying available at 8am to Out of Print in English. What gives? Did it magically sell out without going live? I wait the before of 15 minute of the time start . I had continue to refreshed the page and opened new page but don’t appear the icon for buy it. Hm, I had the same issue on my Mac – but the button was shown on the iPhone in my hand. Go out my copy when I was completing the process: when I went to shipping and payment, my cart was only shipping cost. When I was trying again, the “add to cart” button there wasn’t available anymore. Arg! Please, are you planning a new edition? Or a new kickstarter? For those of us that we’re successful, any word when shipping will begin? I had the same problem. Sold out while I was finishing up a telephone call at work – one minute there, next minute gone. There is obviously a huge demand for this designer edition and I’m sure no one who bought it expects it to lose resale value of there are a few more copies floating around, so any chance of another Kickstarter? If you do a reprint please consider adding the underground races too! Even if they are in a separate box. And if you are afraid that it won’t bring back the money, launch a kickstarter project and those who are interested can prefund their boxes. I wouldn’t want underground packed as a stand alone unless we could also get this designer edition. Maybe have a kickstarter that funds underground in its own box maybe with realms included as the beginner level but then also have a level that includes receiving a copy of the standard designer edition. all ready seen 2 copies now put up for sale on http://www.boardgamegeek.com/geekmarket/product/753031. $1300 EACH. How did he manage to get 3 copies? I thought it was limited to one per buyer. Any comments on this, DoW team? Has there been a response by DOW? The kickstarter debacle (hidden as a IOS addon) now it’s sold out in seconds. I love your product, I want your product and not getting it makes me an unhappy customer. Please look at the conan boardgame on kickstarter. They are behind schedule but open and communicating. The comments they have are great. Please communicate. Pleace make an orderform, so we can order a copy. SOLD OUT is not what we want to see. We can wait till our version is finished as long as we know it’s in the making. this way there are a lot of unhappy people. Will more of these become available?